Sesame Street has been educating and entertaining children for over 40+ years, and the way they stay relevant is by taking the pulse of what is popular in the world and relating it to the children they are targeting with their programming. They have done so for years, and continue to do so in epic fashion. In honor of the upcoming release of The Hobbit 2: The Desolation of Smaug, Cookie Monster takes a trip to Middle Earth in The Lord of the Crumbs! 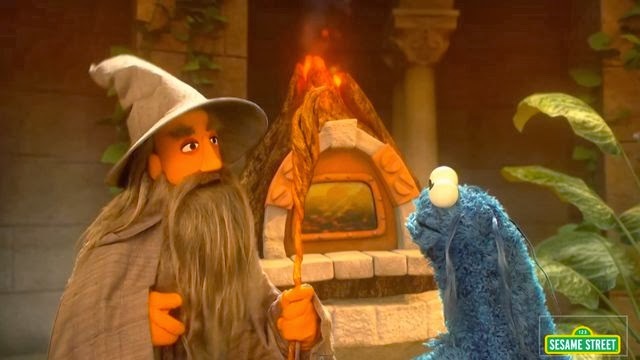 Check out this awesome collaboration video that features Gandalf, Galadriel, and many other familiar facets of J. R. R. Tolkien's epic adventure. Sesame Street keeps it going once again... enjoy!